You’re Just 5 Steps Away from Turning Even a Tiny Audience into a Mass of Buyers! This is an in-depth video training series. Designed to show you everything you need to know to build up an audience from scratch – or tack onto the audience you’ve already built for bigger earnings. There’s no guessing here. I’m going to guide you through, step-by-step. So by the end, you’ll be set-up and raring to go. In fact, I’m so confident you’re going to enjoy this course (and LOVE the results! ), I’m going to tell you exactly what’s inside. This is the research phase to make sure you’re targeted profitable niches, and avoiding the money wasters. You’ll build a strong foundation, while sealing all the cracks for ongoing success. Giving you peace of mind that your business will never crumble. The secret method for getting extremely cheap clicks to stretch your advertising budget, while getting the biggest ROI. Separated in 3 core components, this guarantees your ads will be extremely cheap and highly effective. How to infiltrate your competition to laser target your ads and offers for maximum profits. Easily uncover important demographic information to pinpoint your audience for even bigger returns. You’ll get instant access to my personal materials to make the research phase quick and painless. Selling your product is a breeze… when you have the right offer page. Don’t sweat, I’m going to break it down for you. Making the entire process dead simple. By the end, you can be confident your offer page is flawless and ready to draw in your buyers. How to carefully craft an irresistible hook that will leave your buyers clawing at each other to get inside. Constructing a product description that will easily turn even the most hesitant visitors into buyers. Securing the sale and giving your buy button a work out. Warning: this section is crucial and must be done correctly, otherwise you risk losing the sale. How to shoot a concise demo video that will dramatically cut down your refund rate and workload. Confused buyers will make your life hell. This simple formula will create dedicated buyers that will stick by you for the long haul. This section is all about keeping your costs down. It’s easy to run up an expensive ad bill with little to show for it. Here I will break down how to create highly effective ads for a minimal investment. The 5 components every high converting ad have must have. With these mastered, your ads will easily attract a ton of clicks with hungry buyers running the mouse. The secret to choosing a winning image for you ad. And how to avoid a bad picture that will repel your audience. High converting ad copy that will maximize your clicks. With a well-crafted headline, you’ll easily grab the attention of your buyers. Putting all the pieces together to create a successful ad campaign. By this section, you’ll be able to ramp up into high gear. If you’ve ever wondering how the million dollar guys are so successful, this is it. Together, we’ll make sure your ads are hitting the right people. The most highly effective ad type available to you, and the perfect conditions to exploit its power. How to get influential celebrities in your niche working for you. Launching your business to a new level of fame, and creating a recognizable brand your buyers will instantly love. Showcasing your product, service, software or startup in front of your best audience. The 5 simple questions that will have you making ad bids like a pro. Measuring your success is key to ensuring your ads are at optimal performance. This final section will walk you through testing, tweaking and editing to reach your full earning potential. 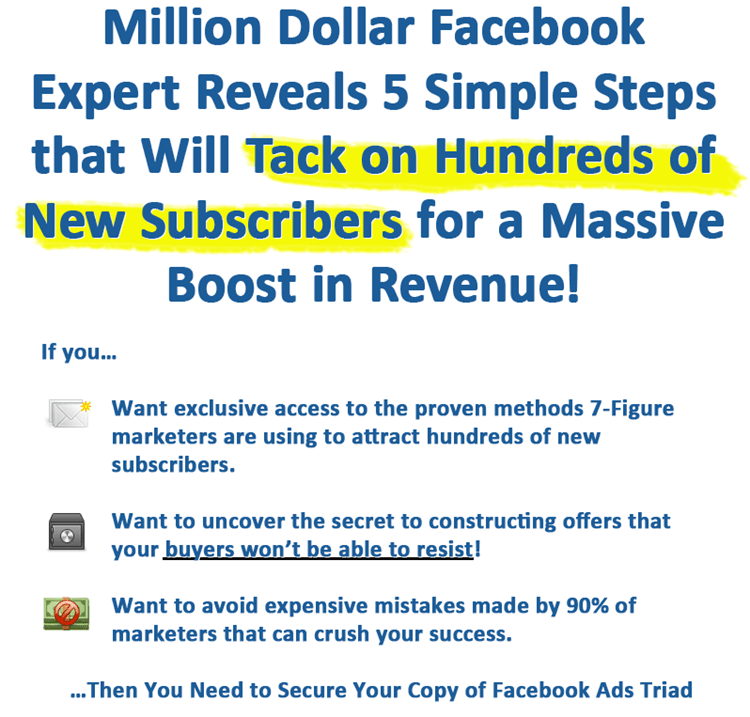 This separates your average hobbyist from a real Facebook ad pro. Inside look at a private case study that showcases how to split test each ad, from start to finish. This will allow you to make intelligent tweaks for maximum efficiency, without ever taking a shot in the dark that could cost you. How long to run your tests to ensure you’ve got adequate data to separate the winners from the losers. The small tweaks that can transform into huge gains. Fixing the most common problems that 90% of marketers make. If you’re ads aren’t gaining traction, these simple techniques will turn your campaign around. I’ve broken everything down to make it super simple, and highly effective. So that list your about to breathe some life into will be much, much more valuable to you. Not only will you see how to create irresistible offer places, this is your opportunity to massively expand your subscribers.